Fayetteville native Dane Eifling has been selected as the newly created position of campus bicycle and pedestrian coordinator. In response to active transportation trends, the city of Fayetteville and the University of Arkansas have teamed together to create this position as a more unified approach to our community's transportation planning, programming, and implementation. Eifling earned his Bachelor of Arts in human geography with an emphasis in urban planning and transportation from San Francisco State University and went on to work for the Navy Reserve in 2012. While in the Navy, he oversaw earth-moving operations as well as logistical transport. "Transportation was tying together a lot of things I was seeing on a day-to-day basis," Eifling stated, "I was interested in finding more efficient ways to move people." Previously, Eifling coordinated bicycle programming with the city through a contract with BikeNWA. 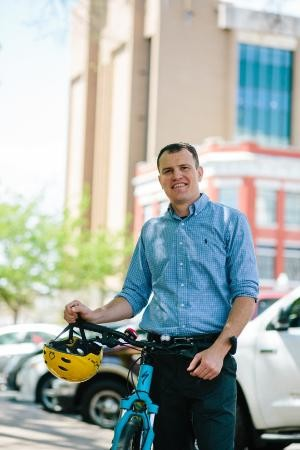 In his new role, Eifling will develop city-wide bicyclist and pedestrian education and safety programs as well as increase awareness about the walk/bike ability in Northwest Arkansas. When asked about his biggest goals for the future, Eifling replied, "I am most interested in trying to see where the city and university can collaborate on making pedestrian travel more enjoyable." Many in Northwest Arkansas are turning toward active transportation for physical, mental, and financial health; however, the availability, safety and ease still limit the transportation options for many people. Eifling recognizes this and with the new city and university collaboration, Fayetteville can continue to eliminate impediments and increase transportation options. "It is going to be a group effort to reach Fayetteville's goal of a more interconnected transportation system for all, but this partnership is progress," said Eifling. The city's Active Transportation Plan can be viewed or downloaded as a PDF here, and the University of Arkansas' Guide to Bikes on Campus can be viewed at bike.uark.edu. For more information on U of A sustainability programs and what you can do to help, please stop by the Office for Sustainability for or contact them at sustain@uark.edu.